What’s the problem with block and chain moorings? Traditional block and chain moorings destroy important fish habitat. 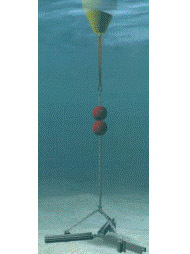 Traditional swing mooring designs use a dump weight (usually a concrete block) on the seabed linked to a heavy chain, ropes and floats to hold vessels in position under a range of weather conditions. Most moorings are in shallow and sheltered waters, the ideal sites for sensitive habitats such as seagrasses, soft corals and sponge gardens. Seagrasses are important nursery areas for many recreational and commercial fish and invertebrates such as snapper, bream and crabs. The boat swings with wind and currents causing the chain to scour the seabed and seagrass, leaving a circular bare patch around the mooring block. If the block is even slightly re-positioned when servicing the mooring causes further damage. Wave action on these scour patches can cause the sediment to further erode and destabilise the remaining seagrass bed. This can lead to large-scale losses of seagrass. You can see this scarring in seagrass from aerial photos. The scar size depends on (a) water depth and boat length (which both relate to the length of the chain) (b) type of seagrass (c) the age of the mooring, (d) how frequently a boat is on the mooring and (d) environmental conditions at the mooring site (e.g. exposure to wind and waves, tidal range). So scar sizes vary in different areas. The average scar size assessed for two estuaries in NSW was 194m2 in Posidonia and 164m2 in Zostera, with a range of 55 – 706 m2 (Glasby & West 2015). Numerous adjacent moorings can make the seagrass bed look like Swiss cheese. There are over 19,000 boats kept on moorings in NSW waterways. Approximately 12% of these moorings have historically been placed in or next to seagrass beds. There has been an overall decline in the area of seagrass in NSW estuaries to the point where strapweed (Posidonia australis) populations are listed as endangered in six NSW estuaries (Port Hacking, Botany Bay, Sydney Harbour, Pittwater, Brisbane Waters and Lake Macquarie) under NSW (PDF, 1800.58 KB) and Federal legislation. Seagrass is not tough like the grass in your lawn – it may not grow back if it is damaged and transplanting seagrass rarely succeeds. Seagrass needs protection and we need to be reminded of its fragility and importance. There are alternative mooring designs on the market that aim to protect sensitive habitats without compromising the safety or reliability of mooring your vessel. These designs are called Environmentally Friendly Moorings or EFMs. Over 140 EFMs have been installed in NSW waters including Manly Cove, Pittwater and Port Stephens, and over 230 have been installed in Moreton Bay in Queensland. 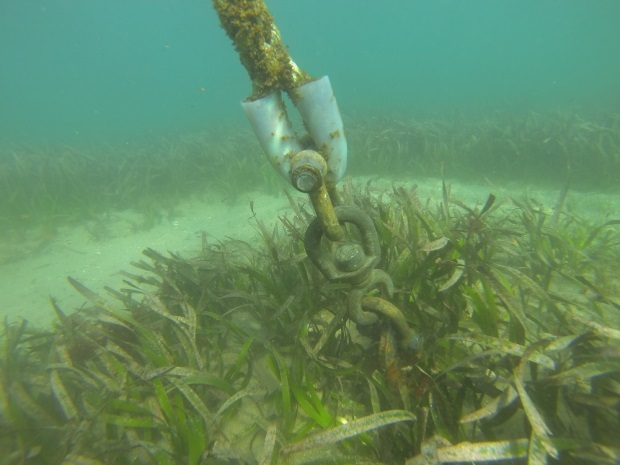 Trials of one type of EFM, the Seagrass Friendly Mooring, were undertaken at Manly Cove, Pittwater and Port Stephens between 2009 and 2013. The results showed overall that this design allowed seagrass to recolonise the previously bare scars. Where seagrass didn’t return it was due to higher wave action and sediment movement preventing seagrass from growing back. Under a hypothetical scenario, two-thirds said they would be willing to make a financial contribution to upgrade from a block and chain mooring to an EFM. The performance of EFMs was tested in June 2014 via a pull test demonstration at Lake Macquarie, NSW. 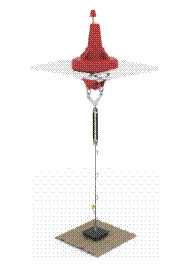 The test was conducted to compare the performance of block and chain moorings with two types of environmentally friendly moorings: the Seagrass Friendly Mooring and the Eco Mooring. Both types of EFMs out performed the block and chain moorings in this demonstration. 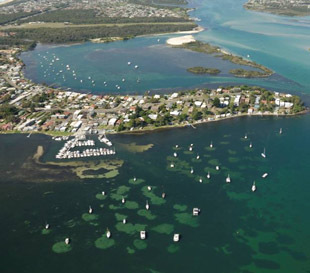 Environmentally Friendly Moorings Project.in Lake Macquarie. Further links are available from this site. A comparison of the impact of seagrass friendly boat mooring systems on Posidonia australis.